His Highness Sheikh Mohammed bin Rashid Al Maktoum, Vice President and Prime Minister of UAE and Ruler of Dubai, has praised the New Zealand Prime Minister Jacinda Ardern for her support to the Muslim community after last week’s Christchurch mosque attacks that killed 50 worshippers. He also praised New Zealand’s communities for their solidarity with their Muslim neighbors against the hate crime. Sheikh Mohammed bin Rashid Al Maktoum said, "New Zealand today fell silent in honour of the mosque attacks' martyrs. Thank you PM @jacindaardern and New Zealand for your sincere empathy and support that has won the respect of 1.5 billion Muslims after the terrorist attack that shook the Muslim community around the world". 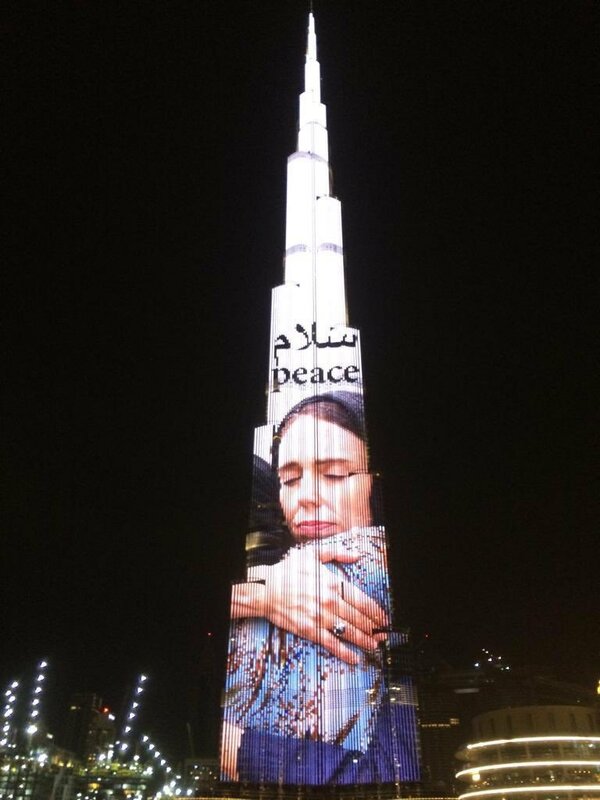 Burj Khalifa also lit up with Jacinda Ardern’s picture as a tribute from the government and people of United Arab Emirates.